Buy PhraseContext Ver. 1.0.2 build 70 – it’s just €35! With PhraseContext you can easily study how key-terms are used, what words they go well together with. You can inductively solve problems of grammar and lexis. Once problems have been solved enter a sample of the text + the keyword + comments on it in you PhraseBook for esay retrieval. Share a PhraseBook across a network with colleagues. Or export it as an XML-file together with a formatting XSL-file for easy access. 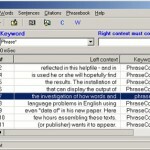 The PhraseBook is a fully editable XML-file. No database engine needed. 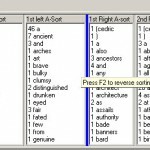 Create wordlists for a big corpus. 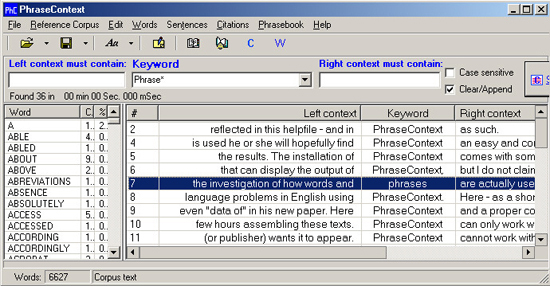 PhraseContext is tested extensively with corpora of 1,000.000 words. 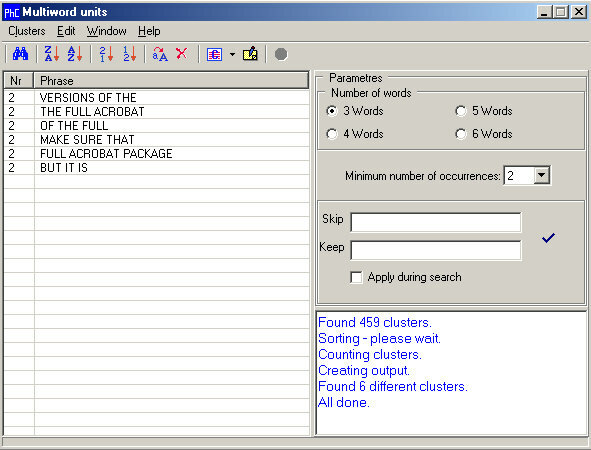 The wordlist gives actual word counts, and percent of the total number of tokens in the corpus. 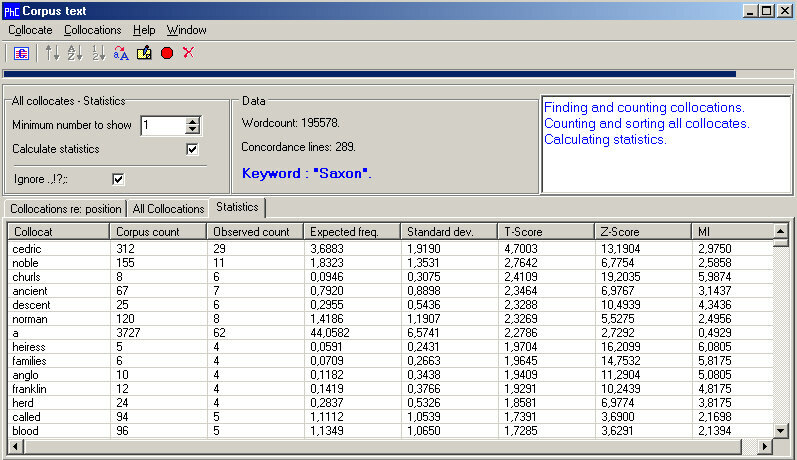 Calculates word lengths. Get the context of selected keywords (more than 2,000 Key-Words-In-Context are produced in less than 1 sec.from a 1,000.000 word corpus. In one go: greate Keyword-In-Context of a series of words. Calculate Type/Token ratio of a large number of files. 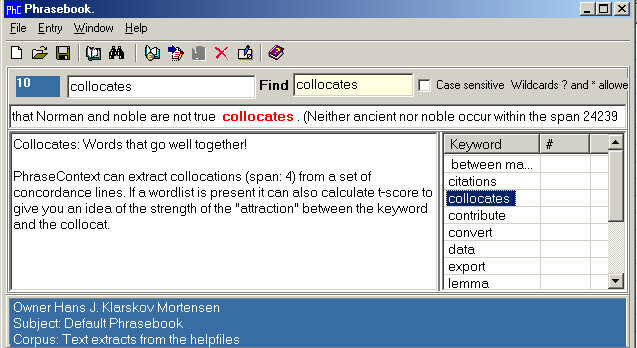 Retrieve clusters of a length between 3 to 6 words. Analyse the context (“concordance”) of these clusters. Get collocations (span of 4 words left and right of keyword/expression). Calculate statistical significance – T-score, Z-Score and Mutual Information in just one grid. Easy export to textformat – for saving or copying into a report – of clusters, citations, wordlist and collocations. Share wordlists and citations through export to XML-format – and apply a XSL-formatting style-sheet. Sentence length analysis – both in key numerical figures and as a chart – save this to a “bmp”-file. Complex Regular Expression’s search patterns. Editor with syntax highlighting. 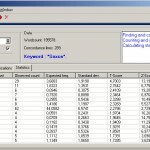 Very easy creation of custom “stoplist” for calculation of lexical density. Once created the stoplist can be saved and reloaded. Discover a novel, poem og play’s keyterms’ linguistic surroundings. Did you know, for example, that in Henrik Ibsen’s play A Doll’s House the most frequent collocations of “mann” (i.e. man) are the possessive pronouns my, your, yours! That the expression “hva er det” (‘what is that’/’what is it’) occurs 32 times – and is the most frequent 3-word cluster in the play. That in Walter Scott’s Ivanhoe “noble” and “ancient” are true collocations of Saxon, but not of Norman! Easily load your students’ essay and analyse them for known over/underuse of certain words. Let your students work with their own texts and edit them directly in PhraseContext‘s editor. Analyse lexical density of their writing. Single or multiple file corpus. Corpus viewer is a small editor with search/replace for interactive work. Adjust context for sense unit – delimiters determined by you. Create a concordance of all the words of a corpus. Plain Windows 32-bit software and no dll’s or plug-ins required. Load default single-file corpus on start-up. Everything is made “on-the-fly” so parametres can easily be changed and new results presented. Main executable file only 1.9 mb. Integrated help-file with references to further reading and relevant specialised literature. PhraseContext can output wordlists, citations and phrasebooks in XML-format for further processing and web-display with added XSL-formattings stylesheets or java-script. Below are some examples. These are not worth much in themselves, and they’re only supplied here to give some idea of the structure of the XML output, and some ideas for XSL-formatting. The idea was to create a basic XML-compliant output that can then be manipulated by means of other tools (css, xsl) designed for that use. I’ll be happy to host other people’s stylesheets on this site. Drop me a line with a description together with the script. For reports, essays and other text-based tasks all the important information about a text produced by PhraseContext can easily be converted to plain text. This can either be copied to the clipboard, or it can be saved to a text-file. Below is a sample of statistics of collocations. Test it 35 days for free!